For the Andreas-Paulus-Petrus Parish at Maassluis in The Netherlands, architects Mari Baauw and René Olivier of Royal Haskoning made a design for a new church. The architects have chosen to introduce the concept ofsegmentation: the segments should act horizontally and vertically, wide, deep and high and should be large and small at the same time. Moreover, it should feel comfortable for groups as well as individuals and it should become a space that breathes. The design by the architects was merely based on the functional requirements of the spaces, meaning that there was no materialization of the design. So the starting point for the structural design was the physical model of the architect. The structural concept of the church consists of five shells that are structurally independent. Each shell consists of three steel arches which are mutually connected by girders. 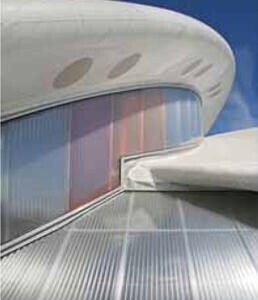 At the top and the bottom side of each shell a PVC membrane is positioned. Onto the lower membrane placeholders are welded in a crucifix shape, which hold an insulation layer. On the inside of the church the stamp of the crucifix weld is slightly visible, effectively bringing a smooth appearance to the inner PVC fabric.